:Whether youâ€™re shopping for a small thank-you gift, a graduation gift, or Motherâ€™s Day gift, the Live By Faith LuxLeather PageMarker is a wonderful gift for any occasion. Inspire your loved one or friend with this this Christian LuxLeather pagemarker to walk in faith each day, and to put their trust and reliance on the Lord. Sold in packs of three Christian pagemarkers, the Live By Faith PageMarker enables you to share the message from 2 Corinthians 5:7. Youâ€™ll help provide a deeper understanding of how the Lord calls us to live our lives. 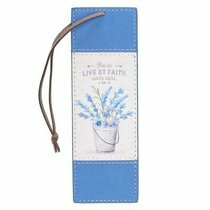 About "Bookmark Luxleather: For We Live By Faith, Not By Sight, Blue Flowers in Pot/Brown Cord Tassel (2 Cor 5:7)"